How do the Northern Lights happen? 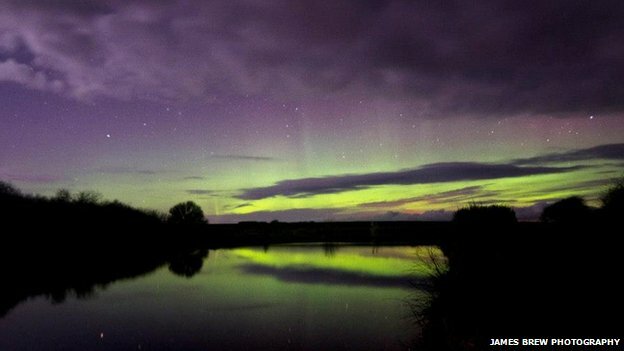 The Aurora Borealis has been photographed on the north coast of the Isle of Man. James Brew, from Andreas, photographed the Northern Lights from Smeale on Sunday. The glow is usually best seen from northern latitudes like Norway, Alaska, Iceland and northern Scotland. Mr Brew said: "I have never seen them on the IOM before. The lights were visible to most of the north of the Island low on the northern horizon." He added: "I had actually only seen the lights for the first time a week ago in Norway, so I knew exactly what to look for and recognised that the glowing band was a sign of activity. "I saw northern light activity pretty much constantly from about 21:00 (GMT) till about 22:30. "The strength of the activity fluctuated through the night but got strongest towards 22:30." The Northern Lights happen when incoming solar radiation hits the earth's upper atmosphere and excites atoms to a new energy state, emitting colours which is energy in the form of light. Gary Kewin from the Isle of Man Astronomical Society, said: "The Aurora Borealis can be seen from the Isle of Man about two or three times a year but it is rare for all the conditions to be right. "I've seen them myself, it really is amazing. All of a sudden the clouds changed from mist to an aurora, I will never forget it." The Isle of Man is chosen as "one of the best places in the world" to explore nature.